Why Primary Care in New Mexico? Quiz – Which program fits you best? The American Academy of Family Physicians offers more information on the ERAS process. The time frame for applications and interviews follows that established by the National Resident Matching Program. Each of our NMPCTC programs (link to Residency Programs page) has separate match numbers. You may rank each of our programs separately. You may submit your application as soon as ERAS allows. We encourage you to submit early. We will be at the National Conference Family Medicine in Kansas City, Missouri. 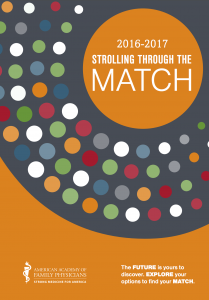 For a comprehensive a comprehensive guide to the Match process from start to finish – including timeline, process, and tips on ranking programs – download this all-in-one resource from the AAFP. This project is supported, in part, by the Health Resources and Services Administration (HRSA) of the U.S. Department of Health and Human Services (HHS) under grant number D06RH27774, “Rural Health Network Development Program,” total award $900K, with 25 percent of program funded by state and nongovernmental sources. This information or content and conclusions are those of the author and should not be construed as the official position or policy of, nor should any endorsements be inferred by HRSA, HHS or the U.S. Government.